Faith and begorrah! I hadn’t known the Little People sent wise men, too! It’s a little known fact that Jesus’ last name was “O’Malley”..
Itâ€™s a little known fact that Jesusâ€™ last name was â€œOâ€™Malleyâ€..
Isn’t there whole series of jokes, “How can you tell the Saviour was Irish?” (Because he he thought his mother was a virgin, because his mother thought he was God, because right before he died he went out drinking with 12 of the lads. . .). They’re mildly offensive, if told in the wrong spirit, and I think maybe someone took them seriously. Oh dear. I think I love you. Holy Corned Beef, Batman! 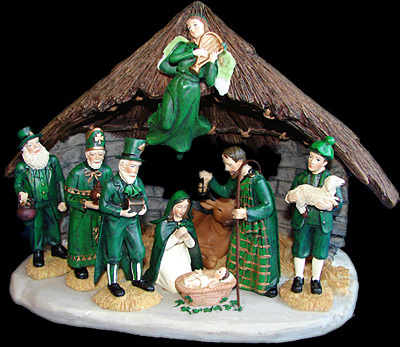 So that’s where my pot o’gold ended up…with JC!I see that the 3rd wiseman has it in his hands, damn him!I like how everyone is standing on their own baseball mounds of straw. How did they keep the cow away from the 4 leaf clover…that must have been a barnyard delicacy in Bethlehem. I’m all about weird – this is TOO funny! This flippin’ ROCKS!!!!!!!!!! I about fell out of my chair! Where can I get one? This is the best ever! Makes me want to crank up some Flogging Molly on Christmas morning. Feed 4 ounces of Guinness Extra Stout every 2 1/2-3 hours or as needed. Burp. Repeat.